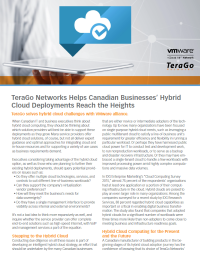 Download this solution brief to learn the considerations you should be making before delving into hybrid cloud or when planning further expansion and how TeraGo can help bring your hybrid cloud deployment to the next level. According to IDC, today almost three-quarters of all enterprises have at least one application or portion of their computing infrastructure on the cloud. But what important questions should IT and business executives be asking about their hybrid cloud deployments, and of their solution providers? Many organizations have only been focused on single-purpose hybrid cloud needs, but studies have found that those companies who have adopted hybrid cloud for more significant numbers of workloads are three times more likely than non-adopters to come close to meeting their business and infrastructure goals.